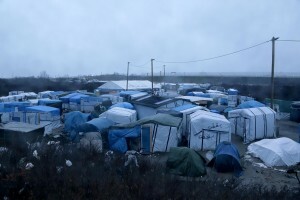 In recent years thousands of refugees fleeing from war and poverty in Africa and the Middle East have gathered in the city of Calais and in the municipality of Grande-Synthe (Dunkirk) - located in the northern area of France - using these places as a stopover point before trying the entrance in Great Britain in the hope of a better life. So real fields called "jungles" were born where people who cannot reach England are forced to live for months in poor conditions, without electricity and lying in tents in the mud. January 27, 2016 – Calais, France: A general view of the migrants camp of Calais, known as “The Jungle”. While migrants have for years sought to cross over to Britain from Calais, the numbers have shot up since the refugee crisis went into overdrive last year. January 29, 2016 – Grande-Synthe, France: A migrant is seen in his tent inside the refugee camp of Grande-Synthe near Dunkirk, northern France, known as “The Jungle 2″. Around 3,000 refugees and migrants of Kurdish descent from Iraq and Syria live in the camp. January 28, 2016 – Calais, France: A migrant is seen inside the refugee camp of Calais, known as “The Jungle”. While migrants have for years sought to cross over to Britain from Calais, the numbers have shot up since the refugee crisis went into overdrive last year. January 30, 2016 – Grande-Synthe, France: A migrant gets warm near a fire inside the refugee camp of Grande-Synthe near Dunkirk, northern France, known as “The Jungle 2″. Around 3,000 refugees and migrants of Kurdish descent from Iraq and Syria live in the camp. 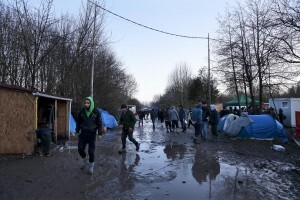 January 30, 2016 – Grande-Synthe, France: Migrants are seen inside the refugee camp of Grande-Synthe near Dunkirk, northern France, known as “The Jungle 2.” Around 3,000 refugees and migrants of Kurdish descent from Iraq and Syria live in the camp. 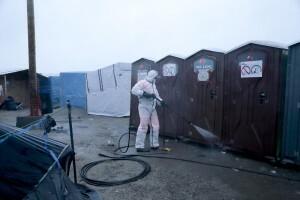 January 27, 2016 – Calais, France: Cleaning inside the migrants camp of Calais, known as “The Jungle”. While migrants have for years sought to cross over to Britain from Calais, the numbers have shot up since the refugee crisis went into overdrive last year. January 29, 2016 – Grande-Synthe, France: Migrants get warm near a fire inside the refugee camp of Grande-Synthe near Dunkirk, northern France, known as “The Jungle 2″. Around 3,000 refugees and migrants of Kurdish descent from Iraq and Syria live in the camp. 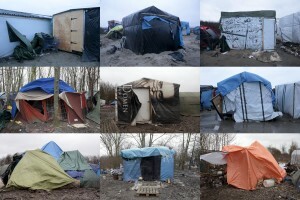 A combination of pictures taken between January 27, 2016 and January 31, 2016 shows tents inside migrants camp in Calais and Grande-Synthe in France. January 29, 2016 – Grande-Synthe, France: A migrant walks inside the refugee camp of Grande-Synthe near Dunkirk, northern France, known as “The Jungle 2.” Around 3,000 refugees and migrants of Kurdish descent from Iraq and Syria live in the camp. 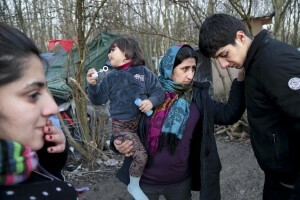 January 30, 2016 – Grande-Synthe, France: An Iraqi family is seen inside the refugee camp of Grande-Synthe near Dunkirk, northern France, known as “The Jungle 2″. Around 3,000 refugees and migrants of Kurdish descent from Iraq and Syria live in the camp. January 27, 2016 – Calais, France: A group of migrants is seen outside the camp of Calais, known as “The Jungle”, where thousands of migrants live. While migrants have for years sought to cross over to Britain from Calais, the numbers have shot up since the refugee crisis went into overdrive last year. 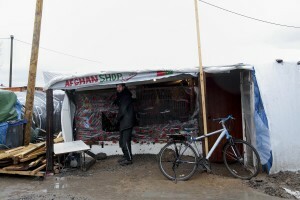 January 27, 2016 – Calais, France: A migrant is seen outside an Afghan shop in the migrants camp of Calais, known as “The Jungle”. While migrants have for years sought to cross over to Britain from Calais, the numbers have shot up since the refugee crisis went into overdrive last year. 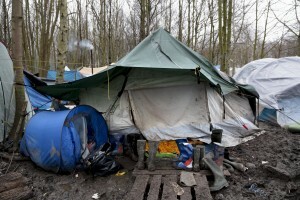 January 29, 2016 – Grande-Synthe, France: A tent inside the refugee camp of Grande-Synthe near Dunkirk, northern France, known as “The Jungle 2″. Around 3,000 refugees and migrants of Kurdish descent from Iraq and Syria live in the camp. 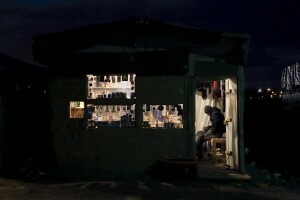 January 28, 2016 – Calais, France: Migrants cook inside their home in the refugee camp of Calais, known as “The Jungle”. While migrants have for years sought to cross over to Britain from Calais, the numbers have shot up since the refugee crisis went into overdrive last year. 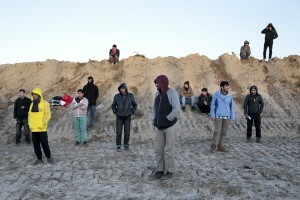 January 28, 2016 – Calais, France: Informal facilitie inside the refugee camp of Calais, known as “The Jungle”. While migrants have for years sought to cross over to Britain from Calais, the numbers have shot up since the refugee crisis went into overdrive last year. 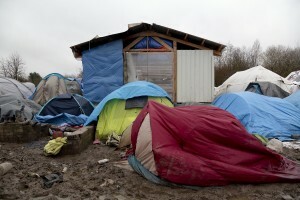 January 29, 2016 – Grande-Synthe, France: Migrants recharge their phones in a tent of Grande-Synthe refugee camp near Dunkirk, northern France, known as “The Jungle 2″. Around 3,000 refugees and migrants of Kurdish descent from Iraq and Syria live in the camp. January 29, 2016 – Grande-Synthe, France: A migrant gets warm near a fire inside the refugee camp of Grande-Synthe near Dunkirk, northern France, known as “The Jungle 2″. Around 3,000 refugees and migrants of Kurdish descent from Iraq and Syria live in the camp. 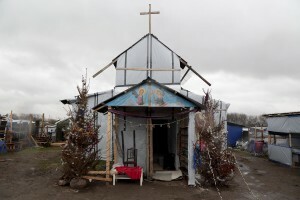 January 27, 2016 – Calais, France: An Evangelist church inside the migrants camp of Calais, known as “The Jungle”. While migrants have for years sought to cross over to Britain from Calais, the numbers have shot up since the refugee crisis went into overdrive last year. January 30, 2016 – Grande-Synthe, France: Migrants line up waiting for food offered by some charities inside the refugee camp of Grande-Synthe near Dunkirk, northern France, known as “The Jungle 2.” Around 3,000 refugees and migrants of Kurdish descent from Iraq and Syria live in the camp. 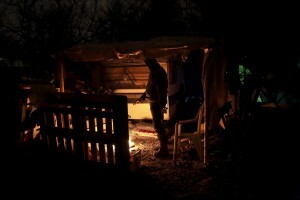 January 29, 2016 – Grande-Synthe, France: Migrants get tea by a volunteer in a tent of the refugee camp of Grande-Synthe near Dunkirk, northern France, known as “The Jungle 2″. Around 3,000 refugees and migrants of Kurdish descent from Iraq and Syria live in the camp. January 27, 2016 – Calais, France: A migrant walks outside the camp of Calais, known as “The Jungle” where thousands of migrants live. While migrants have for years sought to cross over to Britain from Calais, the numbers have shot up since the refugee crisis went into overdrive last year. 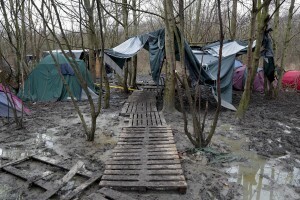 January 29, 2016 – Grande-Synthe, France: A general view of Grande-Synthe refugee camp near Dunkirk, northern France, known as “The Jungle 2″. Around 3,000 refugees and migrants of Kurdish descent from Iraq and Syria live in the camp. 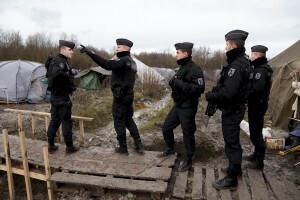 January 30, 2016 – Grande-Synthe, France: Gendarmes performing a check inside the refugee camp of Grande-Synthe near Dunkirk, northern France, known as “The Jungle 2″. Around 3,000 refugees and migrants of Kurdish descent from Iraq and Syria live in the camp. 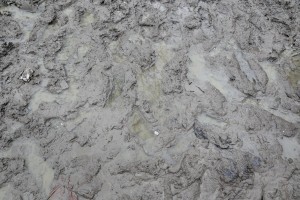 January 29, 2016 – Grande-Synthe, France: Mud is seen inside the refugee camp of Grande-Synthe near Dunkirk, northern France, known as “The Jungle 2.” Around 3,000 refugees and migrants of Kurdish descent from Iraq and Syria live in the camp. 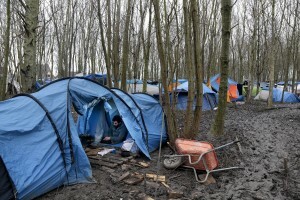 January 29, 2016 – Grande-Synthe, France: Migrants are seen inside the refugee camp of Grande-Synthe near Dunkirk, northern France, known as “The Jungle 2″. Around 3,000 refugees and migrants of Kurdish descent from Iraq and Syria live in the camp. January 28, 2016 – Calais, France: Migrants studying English in a temporary school inside the refugee camp of Calais, known as “The Jungle”. While migrants have for years sought to cross over to Britain from Calais, the numbers have shot up since the refugee crisis went into overdrive last year. 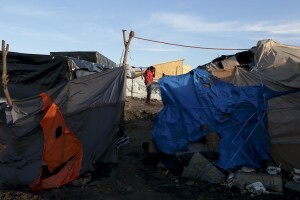 January 28, 2016 – Calais, France: A migrant is seen outside the refugee camp of Calais, known as “The Jungle”. While migrants have for years sought to cross over to Britain from Calais, the numbers have shot up since the refugee crisis went into overdrive last year. January 30, 2016 – Grande-Synthe, France: A volunteer cuts migrants hair inside the refugee camp of Grande-Synthe near Dunkirk, northern France, known as “The Jungle 2″. Around 3,000 refugees and migrants of Kurdish descent from Iraq and Syria live in the camp. 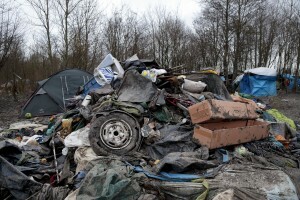 January 29, 2016 – Grande-Synthe, France: Piled rubbish inside the refugee camp of Grande-Synthe near Dunkirk, northern France, known as “The Jungle 2″. Around 3,000 refugees and migrants of Kurdish descent from Iraq and Syria live in the camp. 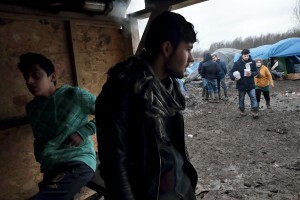 January 29, 2016 – Grande-Synthe, France: Kurds migrant are seen inside the refugee camp of Grande-Synthe near Dunkirk, northern France, known as “The Jungle 2″. Around 3,000 refugees and migrants of Kurdish descent from Iraq and Syria live in the camp. 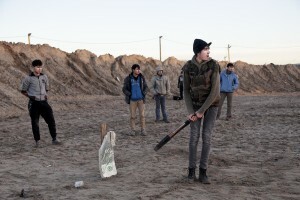 January 28, 2016 – Calais, France: Migrants play cricket outside the refugee camp of Calais, known as “The Jungle”. While migrants have for years sought to cross over to Britain from Calais, the numbers have shot up since the refugee crisis went into overdrive last year. 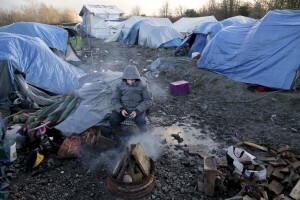 January 28, 2016 – Calais, France: A migrant is seen outside the refugee camp of Calais, known as ‘The Jungle.’ While migrants have for years sought to cross over to Britain from Calais, the numbers have shot up since the refugee crisis went into overdrive last year. January 28, 2016 – Calais, France: Migrants are seen outside the refugee camp of Calais, known as ‘The Jungle.’ While migrants have for years sought to cross over to Britain from Calais, the numbers have shot up since the refugee crisis went into overdrive last year. 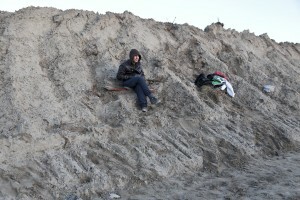 January 28, 2016 – Calais, France: A migrant is seen outside the refugee camp of Calais, known as “The Jungle”, where hundreds of meters of barriers have been erected to prevent migrants to access the highway and hide on trucks headed to England. While migrants have for years sought to cross over to Britain from Calais, the numbers have shot up since the refugee crisis went into overdrive last year.